← Remember When We Predicted Sub-$3 Gas Around Princeton? Well Here It Is. Nobody is going to go on the record about it yet, but it looks like a streetcar is going to emerge as the most attractive option from Princeton’s Alexander Street Transit Study. At a public consultation attended by about 40 people last Saturday, November 9, consultants and committee members of the Alexander Street/University Place Traffic and Transit Task Force presented their preliminary findings. The Task Force has a mission to examine options to upgrade transit connections between Nassau Street and Princeton Junction Amtrak station. Many residents in Princeton believe that the construction of Princeton University’s Arts and Transit project, which involves moving the Dinky Station further away from the downtown, will make transit less available to local people. People only use transit if it is within a 5-10 minute walk, so it would be much more helpful to extend train service into more central parts of Princeton, instead of moving it further away. But as we reported previously, heavy rail cannot be extended through local streets. The Transit committee already terminated discussion of a heavy rail extension, and also nixed the possibility of a high-tech Personal Rapid Transit system. What does that leave? Some sort of bus, variously labeled ‘Bus Rapid Transit‘, or ‘Enhanced Bus Service‘. Everybody involved with the study is at pains to point out that each of these options remains very much on the table, and that lots and lots of details still have to be worked out before they can even make final suggestions. But the technical limitations of light rail, most notably the large turning circle of the trains, make it poorly suited for the tight turns required on local roads leading to Nassau Street. Buses offer several advantages: they are [relatively] inexpensive and easy-to-implement, and could connect more areas of the town to Princeton Junction. But any attempt to replace, or even complement Dinky rail service with a bus is likely to provoke a firestorm of political controversy that would have elected officials running for the hills. A streetcar emerges as the only viable option for technical and political reasons. But would it be any good? There is every reason to think a streetcar could be successful. Distinctive orange streetcars, potentially using clean energy from the University’s solar array, would be a worthy upgrade from the 70s-era Dinky rolling stock. A streetcar could use much of the existing infrastructure along the Dinky right-of-way, but continue on local roads to bring transit service to the heart of Princeton, thereby fulfilling many of the potential advantages we proposed for a ‘dual-mode vehicle‘. Streetcars are a proven technology- as seen nearby with the successful ‘River Line’. Streetcars are also a part of Princeton’s history, because a streetcar line connected us to Trenton from 1901 – 1940 (some remains of the old trolley infrastructure are still visible today). Challenges would remain, both technical and financial, to implementing a streetcar in Princeton. Nonetheless, it could be popular. Dinky advocates value the quick, reliable, unimpeded ride that the little train offers from Princeton station to the Amtrak line. A streetcar could offer that, and much more. * Apologies for the grainy image- we will link to a better picture when it becomes available. The ASUP Task Force continues to discuss potential possibilities. Notice of their meetings is posted publicly on the princetonnj.gov website. There will be further public discussion of the plans before Planning Board and Council. 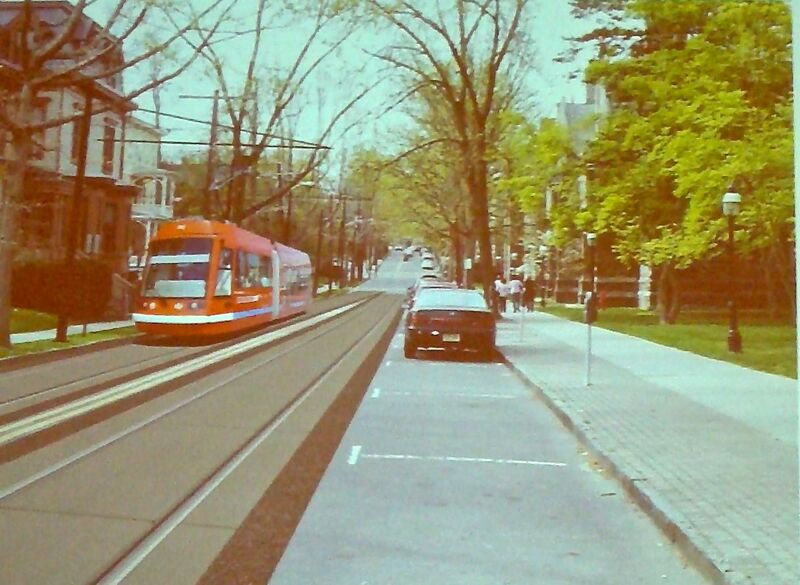 What do you think of the possibility of a Princeton Streetcar? Would you ride it? Could we love it like the Dinky? Please leave your thoughts using the comments box below. This entry was posted in Alternative Transportation, Princeton, Sustainability, Traffic, Transit and tagged Bus Rapid Transit, Personal Rapid Transit, Princeton, Princeton Branch, Princeton University, River Line, Tram. Bookmark the permalink. Was a funding source specified? anything but a BRT! A streetcar looks like a great alternative. Practically speaking, I’d still rather have a BRT…it couldn’t be cost effective without more density (and probably loses efficiency arguments until that point), but it could punch up into the neighborhoods on the outskirts of town and conceivably pick up a lot of ridership. When we need to ride the train…we drive to the Princeton Junction station and skip the dinky. Sorta defeats the purpose. If a BRT went past and went straight up a dedicated busway alongside the Dinky tracks (so there was no transfer)…it would be quick and handy. That said…this would work well. If they trimmed it out like an old school trolley it would even take on an iconic, community-defining role. E.g., “See a play in Princeton and ride the trolley to dinner” as one of the things-to-do in New Jersey. Light rail / street cars mean MEGA BUCKS!!! The rolling stock is very expensive as is installing new tracks in town as all the roadbeds and underlying utilities would need to reinforced to take the heavy weight of the rollingstock. Then you need to build an onsite maintenance facility to repair the rolling stock which will cost 10s of millions more, all to service what? 4 rolling stock units? There is a reason why NJ TRANSIT keeps talking bus. Its a tenth or less of the cost of lightrail. If Princeton wants lightrail so bad then YOU pay for it. Look I love the idea of lightrail but after the consultants start talking $300 million plus to build it you’ll be talking BRT again REALLY fast! I think light rail is a great solution. Bus Rapid Transit would crash and burn in Princeton. People who already own cars (almost everyone, in this case) are statistically less inclined to take bus transit than rail, likely because of the perception that buses are for poor people. Why take a bone rattling bus when you can drive your bmw to Princeton junction? That’s the kind of debate potential riders will subconsciously have. My experience with public transit in Boston (which runs everything from buses to trolley buses, hybrid systems, light rail and heavy rail) has clearly shown that people bend over backwards to avoid buses. The BRT silver line was a tremendous waste of money and everyone wishes it were light rail. A streetcar line could continue down Nassau street from Princeton station and be within walking distance of thousands. Anchoring the other end of the line at Princeton shopping center, for example, would make it easy to ditch the car. Light rail could also make more stops on the current line – perhaps at route 1 for the offices there and again by the lake where the university has parking and other facilities. LRT would obviously be more expensive, but it would be well used and cherished like the dinky always has been.